Why should I choose healthier snacks? How often do you have a delicious but nutritious snack or treat during your break from a long day at work? So often, we find ourselves busy, tired, stressed, rushing, and constantly on the move. But when have you actually stopped to think about that raspberry muffin or that chocolate croissant you quickly grab in the morning while you’re on the go? Is it good for your body? Is it nutritious? Or is it simply just empty calories? It’s always important to know what you’re eating, what’s in it, and what the nutritional benefit is for you. Most common snacks we have on the go are made with processed carbohydrates and packed with sugar where companies remove fat and insert sugar instead, and most of us have been eating huge amounts, often unknowingly and often without being conscious of the health implications. At Maple & Fitz, we are devoted to ensuring that even our sweet tooth cravings are healthy, nutritious, and good for our body (except for our Signature Salted Caramel Brownie!). So what are the most common snacks that we unconsciously opt for at our local café or chain coffee shops? You know ’em. Muffins, Croissants, Pastries, Donuts, Cake slices, Brownies, Cookies, Cinnamon rolls, Granola bars … often packed with all sorts of sugars, processed carbohydrates and stabilisers. Replace those with protein rich natural snacks that contain fibre. Protein and fibre help us feel fuller for longer and help manage our cravings. For example, our Matcha & Pistachio Energy Balls are made with almonds, chia seeds, Medjool dates, tahini, matcha, pistachios and a pinch of sea salt – no artificial additives or refined sugar/ carbohydrates. And what are the most common bottled drinks we grab in a rush? Cola, Energy Drinks, Fruit Juices, Shakes… These are packed with sugar! Replace those for raw cold-press juices, healthy smoothies, and nut milks. So why are processed sugars and refined carbohydrates bad for you? One word – Insulin, a hormone released to transport glucose (sugar and refined carbohydrates) in our body. Excess insulin in response to high blood sugar is followed by a crash in blood sugar levels and when it’s too low, our brain is starved of it’s primary fuel and you can experience symptoms such as tiredness, craving stimulants, irritability, anxiety, and brain fog. The recommended daily amount of sugar is less than 5% of our overall calorie intake, roughly 30g / 7 teaspoons = 1 can of cola. Studies have shown the effect of sugar on the human brain and it has been proven to be 8 times more addictive than cocaine! 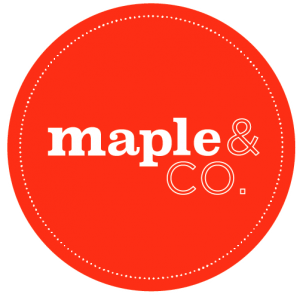 Adria, Founder at Maple & Fitz talks about her TOP FIVE healthy snacks on the go. So next time you find yourself rushing to work in the morning, think twice about what you’re putting into your body and how it’s going to affect you throughout the day.